Princess Cruises' Dawn Princess has completed its maiden visit to Turkey's Anzac Cove, with hundreds of Australian and New Zealand passengers taking part in an emotional memorial service as the ship sailed through the historic waters. The visit to the Gallipoli Peninsula was a highlight of Dawn Princess' inaugural world cruise, which left Sydney in early July. It's also the first visit to Anzac Cove by an Australian-based cruise ship. Dawn Princess Captain Goodway held a ceremony on the ship's top decks in memory of the thousands of Australians and New Zealanders who died at Anzac Cove. The passengers who attended the ceremony included World War I veterans and descendants of soldiers who fought at Gallipoli. 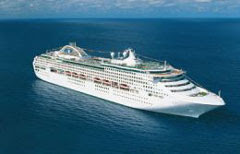 Dawn Princess will return to Anzac Cove again next year during her 2010 world cruise.